A number of different access techniques have emerged within reduced port laparoscopy. The multi-trocar approach via separate fascial incisions and multichanneled single trocar devices have challenged reliable paradigms of multiport laparoscopy (MPL). Although benefits of the reduced port technique have yet to be proven, change has begun without comprehensive evaluation. Given that this new platform will be built on the access techniques, we need to evaluate the different approaches. We compare the restrictions and effects on instrumentation of three access techniques. 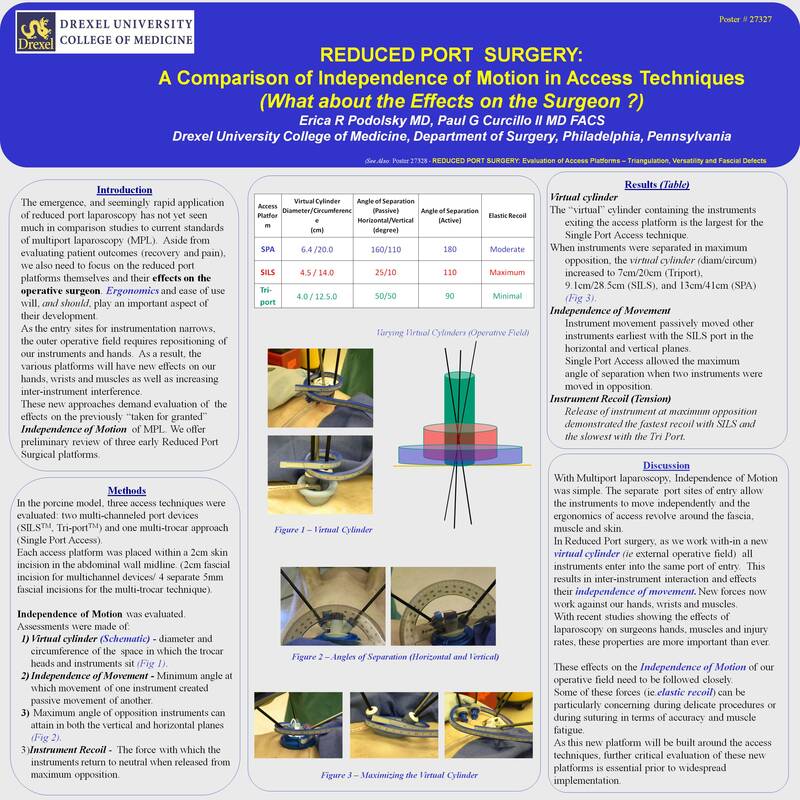 Using the porcine model, threeaccess techniques were evaluated: two multi-channeled port devices (SILSTM, R-portTM) and one multi-trocar approach (Single Port Access). Each access platform was placed within a 2cm skin incision in the abdominal wall midline. A 2cm fascial incision was made for the multichannel devices. Four separate 5mm fascial incisions within the skin incision were used for the multi-trocar technique. Assessments were made of 1) the diameter and circumference of the “virtual” cylinder within which the instruments were placed in-line initially and at maximal opposition, 2) minimum angle at which movement of one instrument created passive movement of the other, and 3) measurements of the maximum angle of opposition of instruments that could be attained via the access platform in both the vertical and horizontal planes. The “virtual” cylinder containing the instruments in line for the R-port, SILS, and SPA had a diameter/circumference of 4cm/12.5cm, 4.5cm/14cm, and 6.4cm/20cm respectively, measured immediately above the port device. When instruments were separatedin maximum opposition, the diameter/circumference increased to 8cm/25cm, 9.1cm/28.5cm, and 14.3cm/45cm respectively. The angles created by movement of a single instrument that resulted in passive movement of another instrument in the horizontal plane were 25, 50, and 180 degrees for the SILS, R-port, and SPA techniques respectively. In the vertical plane the angles were 0, 50, and 110 degrees respectively. The maximum angles of separation when two instruments were moved in maximum opposition were 90, 110, and 180 degreesfor the R-port, SILS, and SPA techniques respectively. Videos of elastic recoil both internally and externally from the point of maximal opposition demonstrate minimal recoil with the R-port, moderate with SPA, and most pronounced with SILS. The paradigms challenged in the conversion from MPL to reduced port surgery will need to be addressed as we progress. Triangulation, abdominal wall tension, instrument collision and independence of motion are affected and may be limited by placing all of the instruments through a single laparoscopic incision. In addition, the effects on the ergonomics of the operator’s hands and forearms will be affected with the passive tension created by moving a single instrument within each platform. As the field of reduced port surgery advances,access techniquesand devices must maintain the safe principles of dissection established by multiport laparoscopy. Critical evaluation of these new platforms is essential prior to widespread implementation.